Hamburg City Tour by Bus, Taxi or Limousine – with a guide who speaks your language* – great for a first impression of the city! 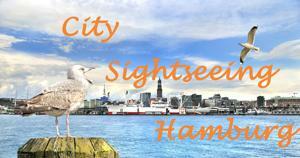 Hamburg City Tour! – You are a smaller or larger group that visits Hamburg by chartered bus and you want to explore our beautiful city with a professional guide who narrates the bus tour in your language? Book a guide for your bus tour! You visit Hamburg with a group but WITHOUT your own bus and you would like to book a guided bus tour first, to get an overview of our beautiful city during a Hamburg City Tour? Book a guide + bus! 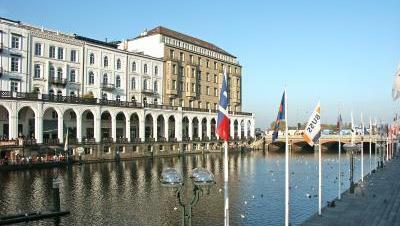 Book your private, individual city tour! 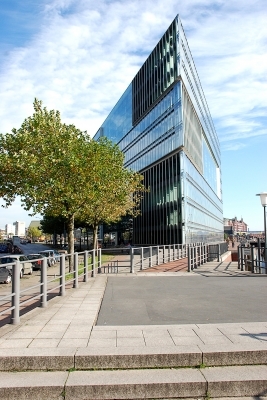 Would you like to explore Hamburg in the comfort of your own chartered bus? Our certified tour guides narrate live and show you all the top sights of the city. If you like we’ll stop at one or 2 locations for a more detailed experience. If you like we can stop at one or two locations to have a closer look at the sights. A stop could be the Old Elbe Tunnel from 1911, the Town Hall, the ship landing pontons, Landungsbruecken, or perhaps the St. Michael’s Church. 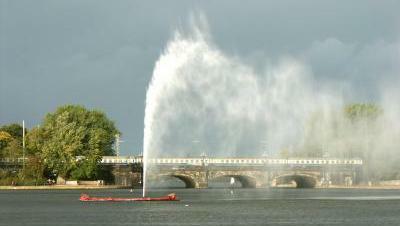 Weather permitting we always like to stop at the Alster lake where you have a magnificent panoramic view of the city and the opportunity to take beautiful pictures. 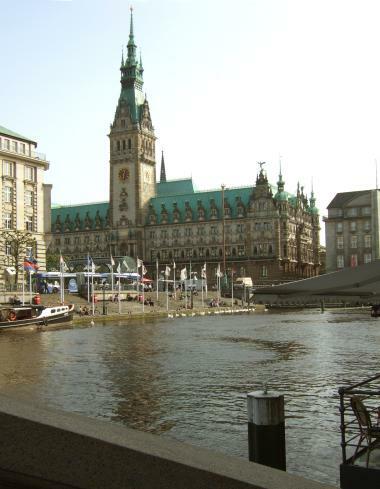 During the 3-hour Hamburg City Tour by bus you will see all the important city sights as mentioned above (2-hour bus tour) and we will include one or two stops for a more detailed exploration. 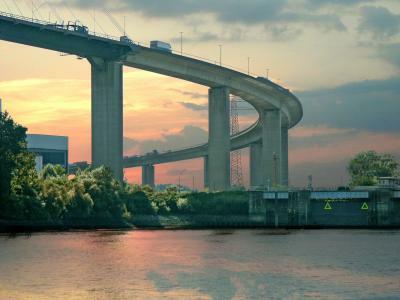 We will have time to tour part of the harbor and will see another major landmark of Hamburg, the Koehlbrand Bridge, Germany’s second longest bridge. From this elevated point you will have another stunning view of the harbor and the city. Please note: As Hamburg is a city with many events like the Harley Days, The Hamburg Marathon or the CyClassics, the route of the bus may have to be modified according to traffic. On this tour during the later evening, you will discover houses that have gone unnoticed during the day. 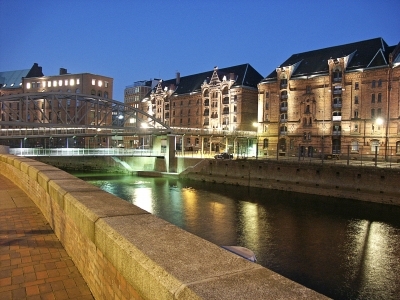 We will pause for a short stop at the Water Castle where the illumination of the warehouses and the canals is particularly beautiful. Call us, so that we can work out a route together! We offer our Hamburg City Tour in English, French, Spanish, Italian, Danish, Swedish, Finnish, Chinese, Japanese, Turkish, Polish, Dutch and in many other common languages. The price for a 1-2 hour live narration in your own bus is 170 EUR. Suggestions for a 2-h bus tour or a 3-h bus tour above. 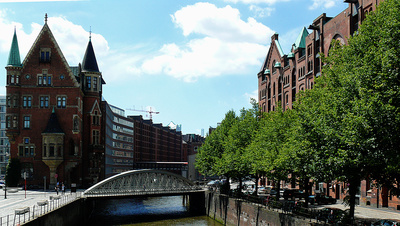 If you come to Hamburg for a narrated bus tour but don’t have a bus yet – no problem! We provide a chartered bus and a tour guide who narrates in your language. Please call us for details and prices: +49 40 67 38 37 60 or +49 176 48 13 80 29 or send us an e-mail. We offer individual tours, custom-tailored according to your wishes. We can rent a taxi, van or limousine for you and if you want to get around in Hamburg like the locals, we also can jump on the subway, the public bus or ferry boat. Please call us for suggestions and a free offer: +49 40 67 38 37 60 or +49 176 48 13 80 29 or send us an e-mail. 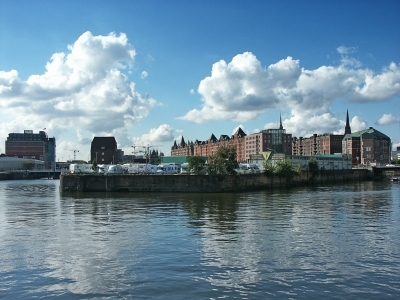 There are numerous possibilities to explore Hamburg, and we are happy to assist you planning your visit.